This block is for Melissa in my Block Swap 2 group. 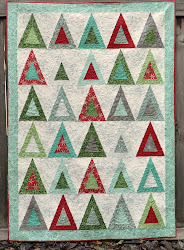 Based on this tutorial over at Cluck, Cluck, Sew. I couldn't make it with the simple, oval leaf shapes--I made mine a tulip tree. One of my favorite trees when I was studying botany in college. One of my friends has one in her yard at her new house--lucky! I think they have a very cool leaf shape and pretty flowers too. If you were wondering, the scientific name is Liriodendron tulipifera. That's so cute! Tulips are one of my favourites. This is so beautiful. I have a tree obsession. I love pics of them and art with trees in it. My favorite tree just happens to be a tulip tree...I am lucky enough to have one in my yard...my Mom planted it for me 19 years ago (I live in the home I grew up in). I love this block thank you for posting it! Love it! And thanks for reminding my about the tulip tree - we had a hughe one in our front yard growing up. It's one of the few trees whose scientific name I remember from college - OH so long ago - Liridendron tulipifera! I love how it turned out!! I can't wait until the real tulip tree blooms! i love this!!! it is adorable. i have never seen a tulip tree before. It turned out very nice! My neighbor has a giant huge old tulip tree that borders our property. I love those leaves, and they are literally as big as my head! I love the changes you made!! So much character, it's lovely! How cute your items are. Like your blog. Wow! This is so pretty! I love your tulip tree! 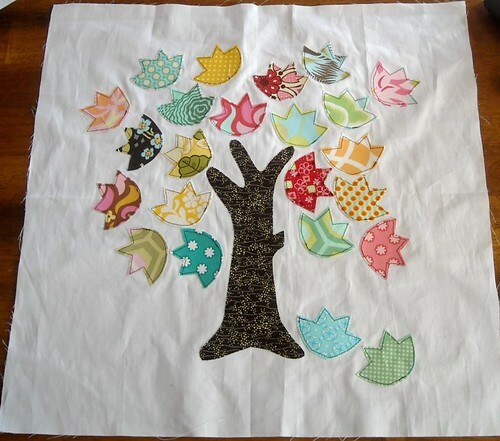 You're so talented with applique! Thanks for the tute link too!